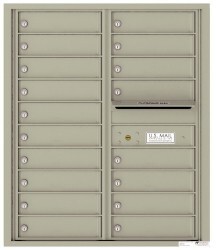 US Mail Supply offers a selection of locking residental mailboxes. These high quality units are secure and durable enough to withstand the driving snow of winter, the harsh summer sun, and anything else Mother Nature throws at them. Order your locking residential mailbox today. Our Letter Locker Mailboxes are not only the best outdoor mailboxes on the market, they're also affordably priced. If you need a durable, sleek, well-designed mailbox in front of your business, our letter locker mailboxes are the perfect choice. With several powder coat finishes to choose from and a heavy-duty steel body, no weather or vandalism will affect this mailbox. Some of these Letter Locker Mailboxes are only meant for small businesses, not residential use. If you need a mailbox for residential use, or have questions about the size of the compartment, please call one of our sales representatives today to ensure the right order is placed. This type of mail delivery system is both USPS and private mail approved. 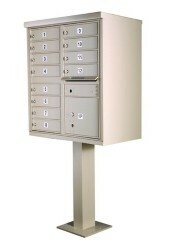 With its front and rear access doors, this mailbox is perfect for multi-unit buildings. Built with aluminum to resist both weather and vandalism, this mailbox has an outgoing mail tray, a lock with two keys, and an adjustable red signal flag. Available in 4 powder coat finishes to match virtually any surroundings. Browse all outdoor pedestal cluster mailboxes for locking outdoor mailboxes for apartment buildings & multifamily residences. USPS approved locking mailboxes from US Mail Supply are available in a wide variety of styles and finishes. We carry residential post mailboxes, indoor mailboxes, wall mounted residential mailboxes, and everything inbetween.